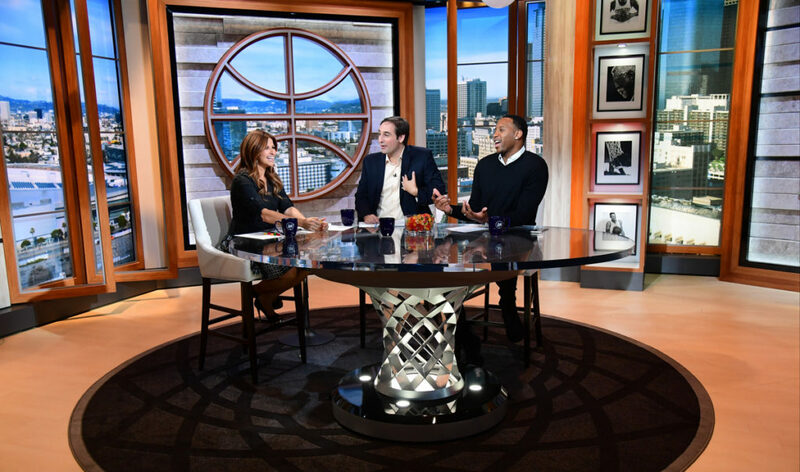 ESPN’s “The Jump”, the daily NBA studio show, has a new set that finds creative ways to integrate a variety of basketball iconography. 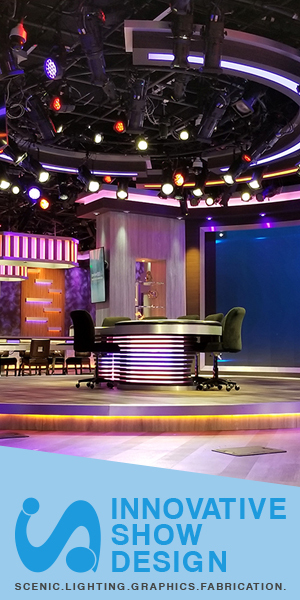 Designed by Jack Morton PDG, fabricated by Mystic Scenic and lit by FLDA Lighting Design, the set creates a fresh and contemporary look for the talk show, using basketball imagery without feeling overly in-your-face. 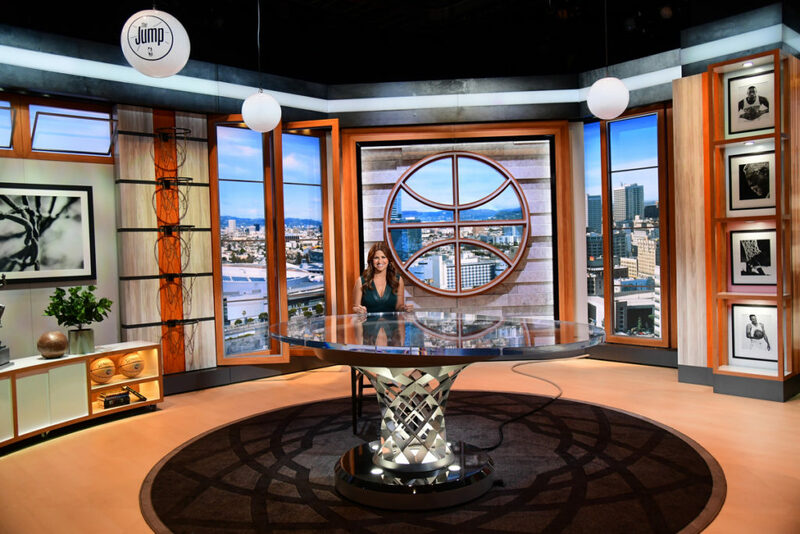 The first, and perhaps most obvious element, is the set’s rounded window camera center with lines that create the outlined shape of a basketball while also providing a view of Los Angeles, where the show is based. This window is then surrounded by a textural, extruded wall with a horizontal pattern reminiscent of either the wood planks on a basketball court or the concrete risers found in stadiums. The set also has a strong emphasis on vertical lines, ranging from high faux windows to vertically stacked open shelving, which could be a subtle nod to the stereotypical height of basketball players but also the huge expanses found in indoor arenas. Photo courtesy of Scott Clarke / ESPN Images. Included in the design are a vertical arrangement of basketball nets, which are accented with dramatic downlighting to capture the shadows formed by the net material and rims. On-air, these nets are used for sponsor billboards during rejoins to add a bit of visual interest. 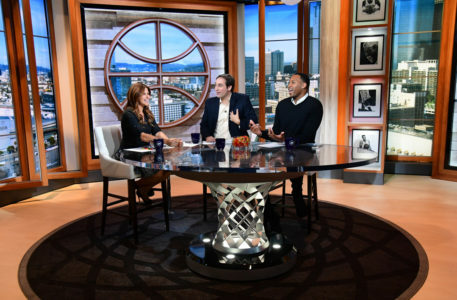 Framed black and white imagery of both iconic players and extreme closeups of basketball equipment are scattered throughout the set, including in the aforementioned four tier shelving unit. The unit, which also includes integrated accent lighting, is somewhat reminiscent of the open cubbies found in locker rooms. The table where host Rachel Nichols sits looks, at first glance, to be a rather typical glass table you might find in someone’s foyer — but if you look closely, the metallic uplit base forms a funnel-like structure inspired by a basketball net with integrated lighting to help the shape stand out. Rounded globe lights round out the design, an additional nod to the basketball shape, while also adding a bit of a nostalgic and informal feel to the space. The remainder of the set uses similar textures and materials found elsewhere, as well as the addition of low, console-style tables that are curved to match the general footprint of the set — a half circle. With this type of set, it could have been quite easy to take the idea of using the textures and shapes found in a sport to the extreme and have the set look like some kind of odd shrine to the sport. However, this design manages to combined some obvious homages to basketball but in tasteful ways — while also strategically “sneaking in” other references to the sport elsewhere to create a classy set that feels warm and inviting.